My mother-in-law passed away a couple of weeks ago; she was a wonderful lady and will be sorely missed. As we were going through her things with the family, there were some interesting insights into Revere Ware cookware. My wife’s parents were married in 1953, about in the middle of the period (1939-1968) where Revere Ware cookware was the preeminent cookware of the day. 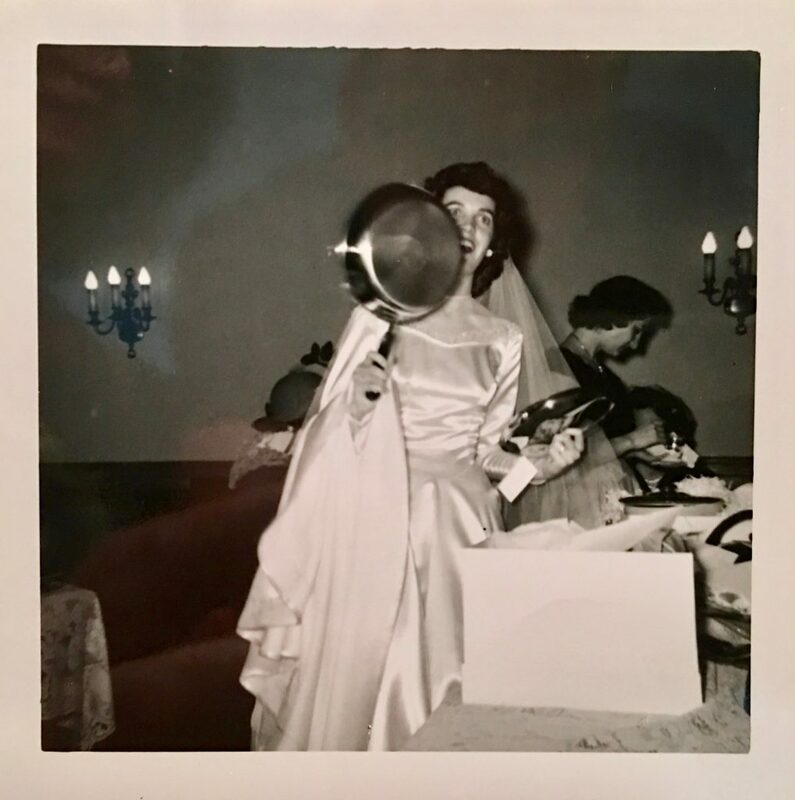 Here she is opening a wedding present – a Revere Ware skillet. I believe that Revere Ware was quite a popular wedding gift back then, as we have heard lots of stories from our customers about still using the same Revere Ware they got as a wedding gift. Here is her cookware now with all new Bakelite parts from us of course. As it is, I believe these are the same pieces they had all through all these 65 or so years. However, what is conspicuously missing are any skillets. As it turns out, we found a stack of non-stick skillets under the stove. Teflon was approved for use in cooking in 1960 and I believe became quite popular starting in the late 1960’s and 1970’s. I suspect some time during this period my mother-in-law (who did all the cooking as was typical for that generation) got rid of the Revere Ware skillets and replaced them with Teflon ones. 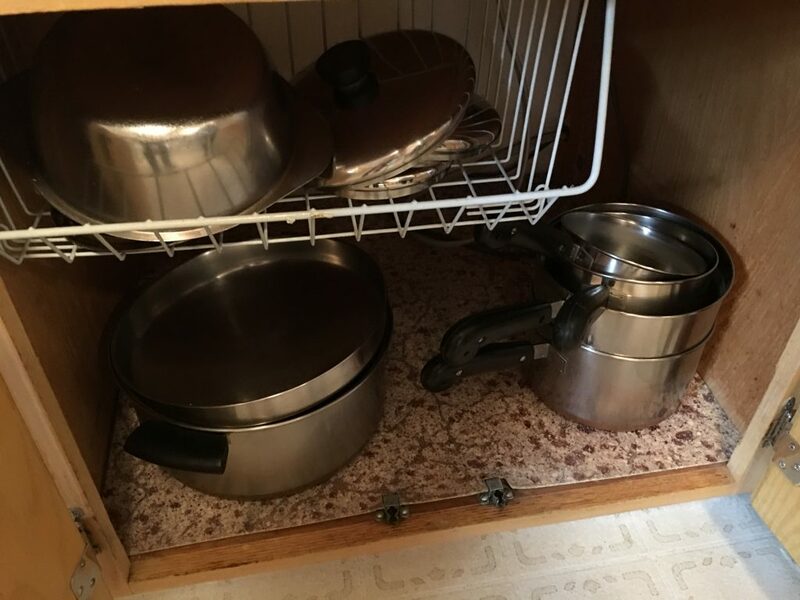 I think this is the point at which a lot of The Revere Ware we see for sale on eBay and in thrift stores comes on the market, at the death of the original generation that bought it. Let’s consider the demographics of the generations that might have purchased Revere Ware in its heyday. The best quality Revere Ware was made between 1939 and 1968. Starting in 1968, Revere Ware cookware started being produced in Korea (and then China) and was made much more cheaply, with about half the metal as the prior version. That is the period when other types of cookware started eating into the market share of Revere Ware. The average age of (first) marriage for women was 21.5 in 1940, and about 20.8 in 1968. The average lifespan of a woman born in 1930 (which would make them or marriageable age in the early 1940’s) was 61.6. For someone born in 1950 (marriageable in the late 1960’s) it was 71.1. That means that people would would have gotten their first Revere Ware cookware at the start of Revere Ware popularity would have started passing away in the mid-1990’s. Someone who got their first Revere Ware towards the end of the popular period would on average pass away around 2010. This can very nicely explain why we have seen in terms of the total number of Revere Ware listings on eBay over the last 9 years. Here is a graph from 2009 to today. While we do see “seasonal” dips over the last few years” it appears that up until a few years ago, the amount of pieces listed at any given time (which peaks around the holidays, just as our sales do) kept going up. It would seem that now, we are past the peak of the passing of the Revere Ware generations. Where is Revere Ware headed?